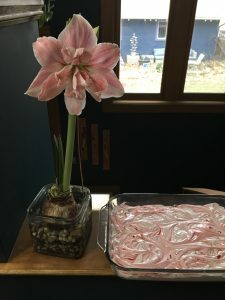 Peppermint marshmallows, two ways. 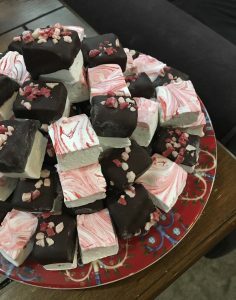 I asked Kavi which she liked better, and she couldn’t decide — the peppermint swirl ones are more intensely peppermint; the chocolate-peppermint ones actually have more peppermint (same marshmallows, plus bits on top), but the dark chocolate has a strong enough presence that the overall effect is less peppermint-y. Sometimes you just have to accept that you love them both, and it’s impossible to choose. 1. Empty gelatin packets into bowl of stand mixer (whisk attachment), with water, vanilla, and peppermint extract. Stir briefly to combine. 2. In a small saucepan (a bigger one will be heavy and hard to hold steadily at a later stage) combine water, sugar, corn syrup, and salt. Cover and cook over medium high heat for 4 minutes. Uncover and cook until the mixture reaches soft ball stage (240 degrees if you have a candy thermometer), approximately 8 minutes. Once the mixture reaches this temperature, immediately remove from heat; if it continues, it will swiftly turn into hard candy. 3. Turn mixer on low speed and, while running, slowly pour the sugar syrup down the side of the bowl into the gelatin mixture. (Be very careful with the sugar syrup, as it is scaldingly hot and will burn you badly if it gets on your skin.) Once you’ve added all of the syrup, increase the speed to high. 4. Continue to whip until the mixture becomes very thick and is lukewarm, approximately 12 minutes. 5. While it’s whipping, butter a large 9 x 12 pan. Prepare an oiled spatula. 7. Allow the marshmallows to sit uncovered for at least 4 hours and up to overnight. 8. Turn onto a board, cut into squares and dust all sides of each marshmallow with the powdered sugar, using additional if necessary. 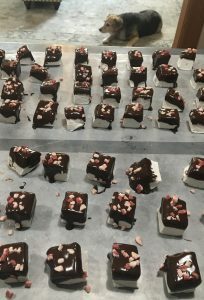 (If making chocolate-peppermint, melt tempered chocolate, dip marshmallows, and set on wax paper. Sprinkle with crushed peppermints immediately, then let dry. May be stored in an airtight container for up to 3 weeks, or frozen.